While I was in Toronto on a business trip, I ate at this amazing concoction of cashew butter, salted date caramel, bananas, black sesame and toast that gave me a sugar high like you wouldn't believe and left me full all day. Inspired by the iQ Food Co, where I got this lovely bit of decadence, I've scoured the internet for a date caramel recipe, and in the end none seemed close enough to what I saw. But, there was a definite foundation to the recipe. So, here's my version. Not exactly the same, but close enough for me. First, I always buy my dates with pits in and pit them myself. They come out really easy. Just rip them in half the longways and pop it out. Bring water to simmer and turn off. Soak pitted dates in water until soft. About 2-4 minutes. I use my fingers to test. Remove dates from water, but keep water. Blend dates, vanilla, and half the soaking water, adding a little more water at a time until consistency is a sticky, thick paste. When it's just about done, add the salt and give it one last whir. 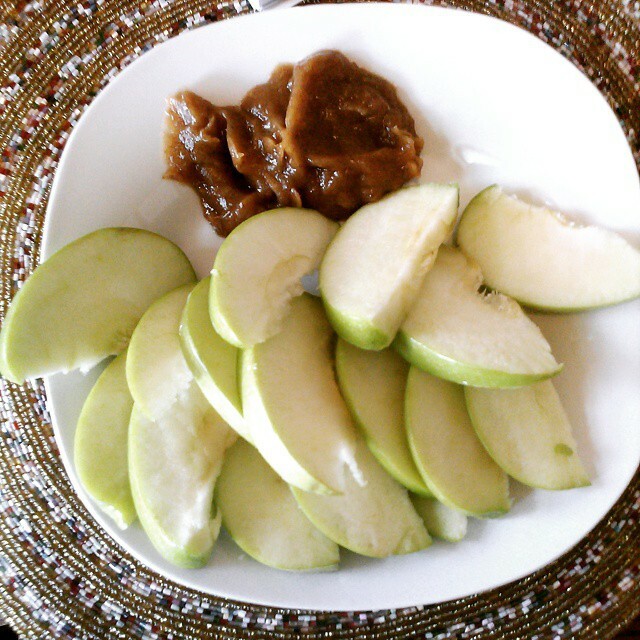 Great with apples, or with cashew butter and bananas on wasa. Toss it in your ice cream, or even use it as a sugar sub. About 50 calories a Tbsp.